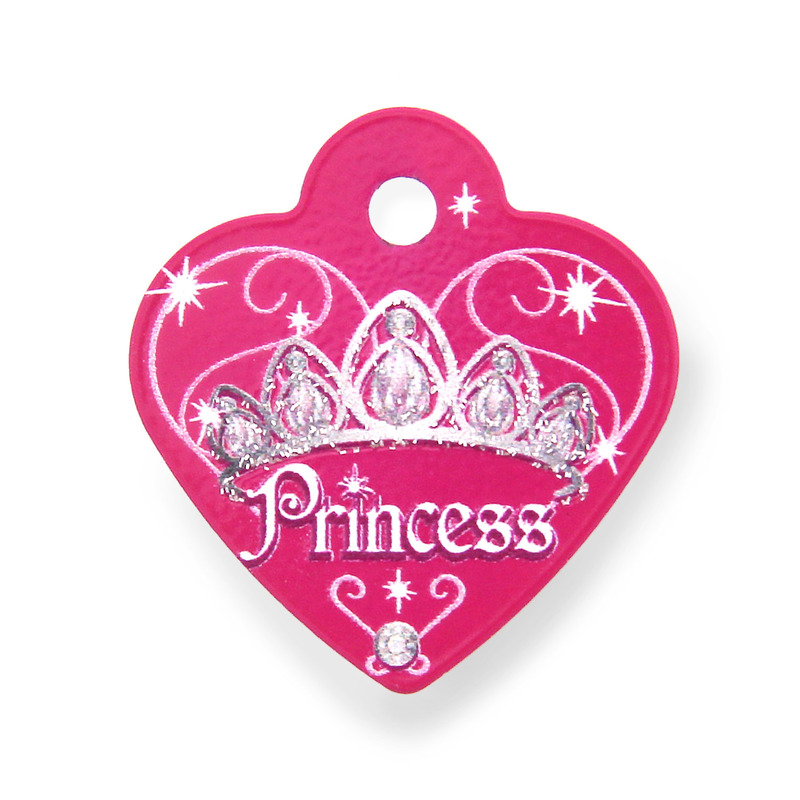 Show your love for your pet and bring them home with a Princess Heart Small Engravable Pet I.D. Tag! The Princess Heart Small Engravable Pet I.D. Tag in pink will show the world that your cat or dog is royalty and should be handled with care. 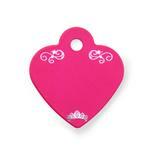 This bright pink little heart will sit next to hers and proclaims that your pet is a princess. To illustrate this point, this lovely tag features a beautiful tiara that's enhanced with shimmery glitter and the word "Princess" in a feminine font. On the back, the scrolling design continues with another tiny tiara. This is where your personalization will appear. On this small heart design, we recommend keeping the engraving simple to increase legibility. The small size of this luxurious tag is ideal for toy breeds, puppies, and cats. The bright pink is eye-catching and easy to spot. It pairs beautifully with many of our sparkling collars to make your little princess feel like a queen! Responsible pet owners I.D. their pets. Don't let your pet leave your house without I.D. so she knows how to get back. Made of brass and painted. Look for other charms to enhance your tag bling. Posted On 05/16/18 by Kandy M from , KS Yes, Kandy M recommends this product! Super cute. Perfect for my 4# princess! Posted On 11/14/16 by Stacy P from , FL Yes, Stacy P recommends this product! This little tag is adorable. Quality is very nice. Looks exactly like picture. Small size was perfect for my maltese. 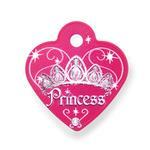 Princess Heart Small Engravable Pet I.D. Posted On 08/23/16 by Yana S from Culver City, CA Yes, Yana S recommends this product! Perfect for a teacup upto small cat or dog. Love everything I ordered and Very Pleased with The Delivery Time.